Bloomsbury USA Childrens, 9780802735065, 32pp. Count along with every scooping, mashing, and spinning family of trucks in the construction site--all the way from the bright early morning till it's time to snuggle in to bed. 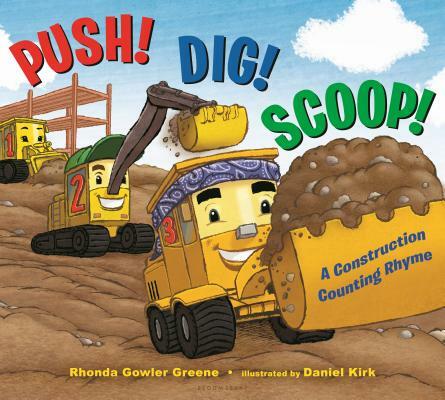 Picture book talents Rhonda Gowler Greene and Daniel Kirk have joined together for a book that will dig its way into the hearts of those who love Where Do Diggers Sleep at Night? and Digger, Dozer, Dumper. Rhonda Gowler Greene has fond memories of being at her grandma’s. She remembers driving a tractor, climbing huge trees, and catching lots of fireflies. Ms. Greene is the author of Barnyard Song and The Stable Where Jesus Was Born. A former preschool and elementary teacher, she lives in West Bloomfield, Michigan, with her family.